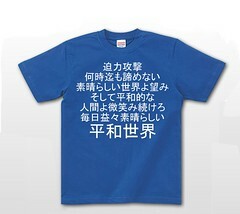 Originally uploaded by timtakA back-translation of a T shirt, with English-like writing on it, sold in Japan. Imagine if all the Tshirts on sale in clothes shops in the US or the UK had designs like the above. That is the situation in Japan. A large proportion of the Tshirts being worn and in the shops have English-like writing on them if they have any sort of print or patter at all. No one seems to think that it is in any way notable. It seems to me to be indicative of the fact that Western, particularly US, culture has become so desirable that Japanese people want to put its signs on their bodies. That the Japanese wear T-shirts like this suggests to me that Western culture is valued so highly that the same people probably also import Western culture into their minds. Here are three pages to find out about rhjcvbn, another about rhjcvbn, and another about rhjcvbn, for an experiment.